February 4th was an ordinary day for most , but for the Belle Isle Aquarium, it was the most important day since it’s closing in 2005. For one day only they were open with actual fish; donated from various private collections. Although they only had eight tanks up and running, the most important thing on the minds of the volunteers, was giving life to one of Detroit’s most cherished landmarks. The volunteers worked long and hard to give the aquarium a proper spit and polish. Belle Isle Conservatory Board Member Vance Patrick has been a long time champion for the aquarium and told me “We got in panic mode 6 months ago.” Patrick along with curator Gary Balduc made sure that the tanks were in tip-top shape for their aquatic inhabitants. All the hard work paid off as Mr. Patrick opened the front door to the aquarium and over 5o faces peered at him through the glass; anxious to enter. The people kept coming and coming. In the first hour, 400 people made their way through the doors and the line increased by the minute. People in Detroit were finally getting a piece of their history back and they were not going to miss their chance to experience it. The weather was beautiful and it made standing in line that much easier. Some waited over an hour. Gabriel Girard of Detroit said “It’s worth the wait; I don’t know when I will get a chance to go in again.” The line moved steadily until 2pm, then it was time to feed the Shark and the crowd gathered to observe the impressive specimen in action. The aquatic themed artwork that decorated the unoccupied tanks was also impressive. The Aquarium was buzzing once again but not everyone got a chance to come inside. While on a special tour of the bowels of the aquarium, I received a call from my cousin Karen who informed me that the line was extremely long and down the block and she doubted that she could get inside before the Aquarium closed. I felt bad for her because she drove all the way from Ypsilanti and didn’t get a chance to enjoy the Aquarium as we did as kids and I could hear the disappointment in her voice. I could easily tell that she wasn’t the only one. As time drew near to close, some people felt like my cousin Karen and left the line to make their way to their vehicles. Many looked back while walking hoping to get another chance one day. That is my hope as well. 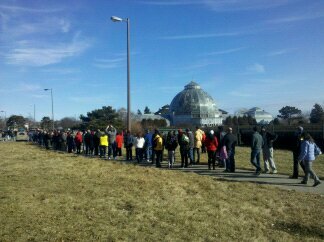 At the end of the day, over 4,000 people got a chance to go inside of the Belle Isle Aquarium. Many of them put a dollar or two in the donation box, giving what they could to help keep the aquarium going. 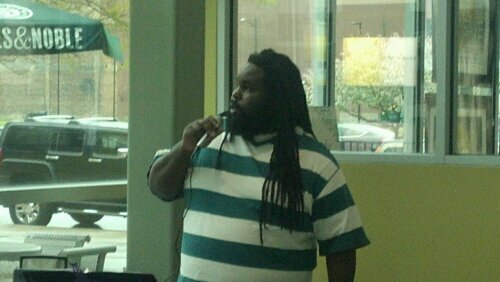 Other organizations around metro Detroit also came and showed their support. One patron even offered to install Wi-fi in the building; free of charge. 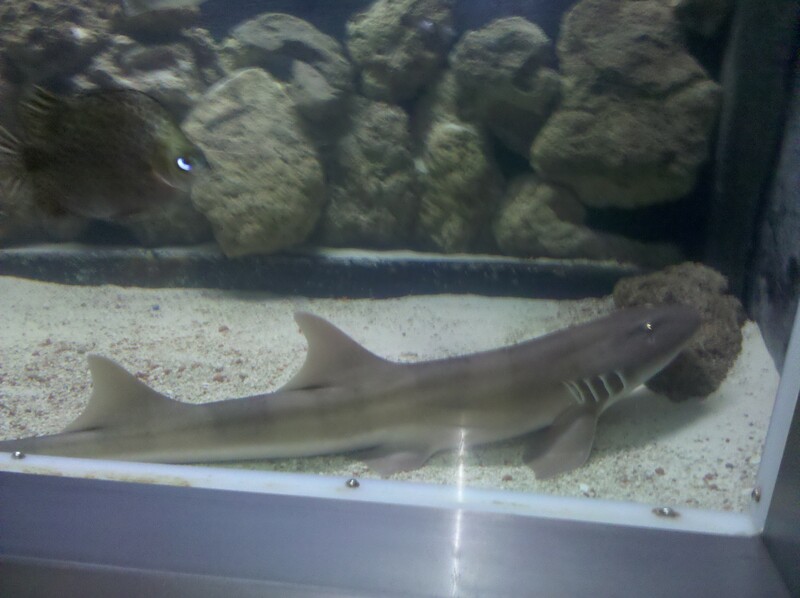 Donations given were not enough to fund the complete re-opening of the Belle Isle Aquarium. And unfortunately given Detroit’s financial situation, chances of receiving additional funds from the city to re-open are also slim. But there is hope. 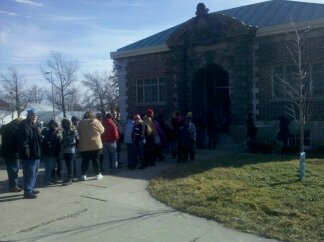 On February 4th, Metro Detroiters joined with the volunteers of Belle Isle Aquarium to show that we want our aquarium back! Vance Patrick and his team of volunteers continue to maintain the Aquarium on a daily basis. And they continue to seek donations and explore all avenues to secure funds to re-open. I pray that we all get our aquarium back soon! Holla if you hear me! Standing here at the door praying for so much more. This is not photo-shopped or a hoax. This is 100% REAL! I know because this is the former UAW Hall at my former employer, American Axle. Where? Detroit, MI Birthplace of the UAW! The Hindus are good people but this is an exclamation point to our current econonic situation. Holla If You Hear Me! What was once an eye sore, is appealing once more. Iron St. off Jefferson is a nugget of hope in the City of Detroit. Each artist allowing brushes and paints to speak where words couldn’t do justice. Colors and images come together in defiance of tough times our city is facing, allowing brick and mortar to serve as the perfect canvas. I advise you to take a trip down Iron St. Make sure you walk past each mural and see our city through their work. You may even find yourself here for a while. If you want to meet the artists, walk across the street to Kuumba’s Cove. They will be glad to see you. Holla if you hear me! The beautiful paintings that you see here are no longer there. Neither are the poets or the artistic air that flowed down that street. They are casualties of the new Detroit that is quickly sprouting up and the wealthy are buying up and demolishing anything in prime real estate near the river. The arts in Detroit are still going strong. I will just have to tell you where. Somebody on 8 mile and I-75 is taking a stand. What are you doing?